We’re all about the developmental milestones around here now. Maddie is now able to sit up! She can’t yet get herself into a sitting position, but if we put her in it, she’s good to go. It’s so stinking cute. It’s a Crawler Corral tm (Rigby is inspecting it). To help Maddie acclimate to her Crawler Corral tm, I got in it with her. Things were awesome at first. We read books, laughed, and chewed on some toys. Life was good. Life was so good, in fact, that after I put Maddie in her pajamas I thought she was ready to play in the Crawler Corral tm by herself. So I set her down, and I got this as a response. I mean, seriously. She looks like she’s in the Crawler Corral tm with the freaking Boogie Man. She cried, she wailed, she kicked her feet, but I was like, “yeah, yeah, tell someone who cares,” while being careful not to look directly into her face. Then she suddenly stopped crying. I felt like it might be safe to look at her. I was wrong. Real tears. I tried to resist. But I couldn’t. Not this time. Oh my god, you guys are in so much trouble. How are you ever going to be able to resist that face when it starts to crumple and the chin quivers? Pray she doesn’t realize how potent that face is or you’ll be giving her a car for her 12th birthday:) I wouldn’t last 2 minutes! At my house we call that thing the Baby Jail. As in, where’s C? Oh, she’s in the Baby Jail. Love it! Seriously though, love it. You can block off a whole room or a corner or make a circle. It’s a fabulous replacement for the playpin. Remember those?? OMG… That is the funniest thing I have ever seen! How evil am I? Neve is scared to death of anything that moves (that is not man or animal). For example, my mother purchased a dancing Elmo. The look of horror and fear in her eyes when Elmo breaks out with “E-L-M-O” (like YMCA) is pricelss. She also fears rolling balls that come in her direction. could her face be any sadder???!?! methinks you might be moving into the crawler corral. hahaha. That has to be the saddest face I’ve ever seen: All red with those glistening, long-lashed eyes. You guys may just be in for a hard time of it when it comes to wanting her own way. How could anyone resist those tears? She looks like she’s in a little Guantanamo. Awwww, the baby-drama. So cute. You, my friend, are hosed. If you had an ugly child you might have stood a chance. But you will be forever tortured by the fact that Miss Maddie is stunningly gorgeous AND knows how to use it. I’m so glad you gave in! Looks like Alex in the playpen. Which we now only use for time-outs. I’ve always been a sucker for the real tears. Maybe she felt the pajamas was her prison uniform and she’d been sentenced to life. patoiss last blog post..Wordy Wednesday #35: Da-da-da-da. Da-da-da. Da-da-da-da. I swear, she’s even more adorable when she’s in tears! Poor little lonely girl! If someone put YOU in jail, wouldn’t YOU be crying for your mommy? I’m no better – last night Blythe was crying in her crib at 3:30 am (we’re trying to break her of her 4:30am waking habit, so we’re letting her cry it out) and as I watched her on the video monitor, she would hold on to the top of the crib, fling her head back so that she was looking DIRECTLY at ME, and howl. HOWL. What’s a mom to do? I am a sucka for tears -but good for your standing your ground – It’s sooo hard. My kiddies hated the pack n plays so I never bothered with one of those bigs play areas…. just gated EVERY dang room in the house. Good Luck! How sad she looks. I could not resist her either. Poor little Maddie. By the way – I’ve gifted you something on my blog. OMG she is just so darn cute! I don’t think I could resist. Oh my goodness, no way I could resist either. I don’t blame you! We bought one of those circular gate things (or rather, I bought it). My husband wouldn’t even let me try to put our daughter into it – he couldn’t do it. He made me take it back to the store the next day. Almost a year old and the house isn’t baby-proofed?? Hahahahah…. I thought Sarah and I were slacking by taking 4 months so far. 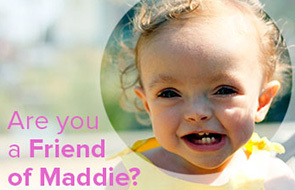 Awww, Maddie, you can come live with me! I’ll let you chew on electrical cords and I’m pretty sure there are some skittles hidden behind the entertainment stand you can have. Just pack that bag and come for a visit. I’ve got news for you little kid, come to my house and you’ll be put in the same damn thing, babyproofing is for parents who care. Heh. Too… cute to not… comment. You almost had the trick down pat– you NEVER look at their faces, even through a camera lens. We call it the baby box and we still get that reaction from time to time.